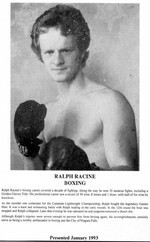 Ralph Racine's boxing career covered a decade of fighting. 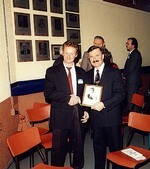 Along the way he won 35 amateur fights, including a Golden Gloves Title. His professional career saw a record of 30 wins, 8 losses and 1 draw with half of his wins by knockout. As the number one contender for the Canadian Lightweight Championship, Ralph fought the legendary Gaetan Hart. It was a hard and exhausting battle with Ralph leading in the early rounds. In the 12th round the bout was stopped and Ralph collapsed. Later that evening he was operated on and surgeons removed a blood clot. Although Ralph's injuries were severe enough to prevent him from boxing again, his accomplishments certainly serve as being a worthy ambassador to boxing and the City of Niagara Falls.